Technology whisperer and product manager, reality capture and digital fabrication at Autodesk. The African Fossils virtual laboratory website is a digital archeology project that seeks to increase public knowledge about prehistory by harnessing Autodesk 3D scanning technology. Recently, they wrote MAKE to tell us about their updated, newly re-launched website featuring stunning Sketchfab integration and downloads of prehistoric humanoid remains. 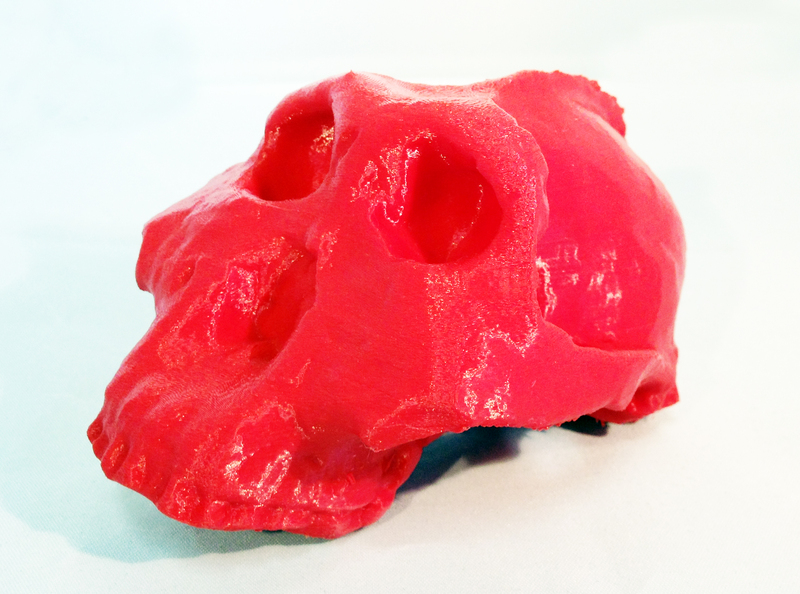 We at MAKE were excited about replicating history on our desktop and printed out our own copy of the 1.8 million year old Paranthropus boisei, also known as “OH 5”, “Zinjanthropus” (southern ape) or the “Nutcracker Man”. We’ve written about Sketchfab before, it’s a dynamic way to embed interactive 3D models on your site. Below is the actual scan of “Nutcracker Man”, discovered in 1959 by Mary Leakey at Olduvai Gorge in Tanzania. OH 5.zip from anvesoft on Sketchfab. For six decades and three generations, the Leakey family has collected thousands of fossils of human ancestors and other animals, as well as stone tools and other artifacts that are stored permanently in the National Museums of Kenya and at the Turkana Basin Institute. Aware of the general inaccessibility of these national treasures in their current locations, Dr. Louise Leakey, a third generation of the ‘fossil hunter’ family, took it upon herself to find a way to make them globally accessible for educators, kids, and science enthusiasts. Inspired by the possibilities presented by new capture and digitization technologies, about two years ago Dr. Louise Leakey began a fruitful collaboration with Autodesk. Other key collaborators on this project include: National Geographic, Stony Brook University and the museums and institutes mentioned above. Most of the models have been captured using photometry and an SLR camera mounted on a tripod. The software used to convert the photos into 3D digital models are: Autodesk®123D™ Catch and Autodesk® ReCap™ Photo. In addition some models were captured with a FARO arm laser scanner or the LMI Technologies structured light scanner. The scanned collections include specimens housed in the National Museums of Kenya and the Turkana Basin Institute field stations. Some scans are taken from cast replicas rather than original specimens. The digital models on this site have been made available under the Creative Commons Attribution-Non Commercial-Share Alike License. Please refer to the Disclaimer and Terms and Conditions for more information. The virtual lab allows the user to explore and “touch” the displayed artifacts interactively. The models are searchable by category, specimen or age. Using Sketchfab, the 3D fossil can be interactively manipulated in browser, allowing the participant to ‘digitally touch’ the fossils. Interactive comparison of a early hominid skull and a modern Mountain Gorilla skull in 3D. Together, the team captured 3D digital models of the most significant fossils, and built a beautiful, interactive web site to host them. This virtual lab showcases a spectacular collection of fossils and artifacts found mostly at Lake Turkana in East Africa. The digital collection of animals, human ancestors, as well as ancient stone tools offers a unique tool for scholars and enthusiasts to explore and interact with the collection online. It also provides an opportunity to download models for 3D printing as well as to comment and share images of your favorite printed fossil objects on our forum. Additional specimens will be added regularly to this online collection. Here’s the most exciting part; you can create your own personalized versions of these scans! AfricanFossils.org has made the models available in two forms: STL files of the 3D models and 2D cutting patterns created using Autodesk’s 123D Make. The 3D models could be 3D printed or routed in wood, foam or other materials. The 2D vector files can then be lasercut or CNC routed into slices that can then be assembled by hand. If you don’t have access to digital fabrication tools, you can still play along at home. Print the 2D files out on paper, trace them onto cardboard, then hand-cut into slices. Regardless of how you cut the 2D files, you will still have to assemble the final model by hand. Dr. Leakey would like to invite makers to use the skulls for classroom learning or for artwork mashups. Sharing your creations with AfricanFossils.org community is encouraged and you can participate on the newly established forums section of the site. Although all the models posted on the site have “Download” buttons, we found that only 9 of the 40 models are actually downloadable. MAKE went through all the scans to see which were actually available now. Louise’s team is busy digitizing further skulls and they will be continually updating the available scans. The collection will grow organically and dynamically, so keep your eyes peeled for a lot more to come!